This section describes how to use Designer to configure provisioning request definitions to support digital signatures. To configure a provisioning request definition to support digital signatures, follow the steps outlined in the following table. Create one or more digital signature declarations. See Section 6.10.2, Creating a Signature Declaration. Specify whether a digital signature is required to initiate a provisioning request. Digital Signature Required: See Section 6.10.1, Digital Signature Workflow Properties. Signature Declaration: Choose a signature declaration from the drop-down list. The list is only populated if you completed Step 1 (above). Specify whether a digital signature is required for each approval step within the workflow. Each approval step can have more than one outgoing link. You must specify the Digital Signature Required property and the Signature Declaration properties for each approval step and each outgoing flow path. For a description of the property settings, see Section 6.10.1, Digital Signature Workflow Properties. Determine the forms that contain a title control. Title controls have a property called Display title in signed form document. Determine for your application and use of digital signatures whether this property should be set to true or false. For more information on this property, see Section 5.5.20, Title. 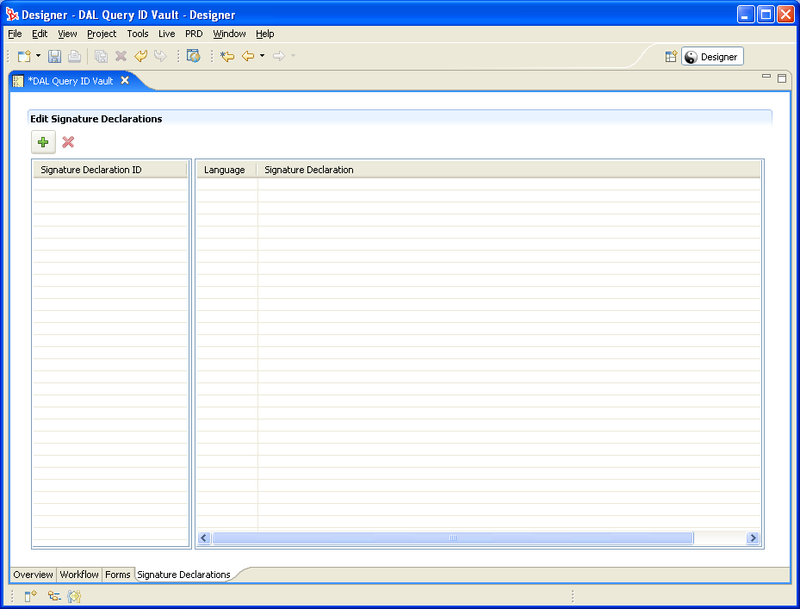 Data: Specifies that the XML signature serves as the user agreement. When you select Data, the XML data is written to the audit log. Form: Specifies to generate a PDF document that includes the digital signature declaration. This document serves as the user agreement. The user can preview the generated PDF document before submitting a request or approval. When you select Form, the PDF document (encapsulated in XML) is written to the audit log. Specifies a digital signature confirmation string that certifies the user’s signature. See Section 6.10.2, Creating a Signature Declaration. Open the Signature Declarations tab. A unique identifier for the signature declaration. This ID is displayed in the drop-down for the Digital Signature Declaration. Choose a language and specify the signature declaration translation for that language. The signature declaration string is also exported as part of the Provisioning view’s Export > Export Localization Data so that you can send the declaration to be localized as part of the rest of the User Application display labels and strings. The string to display in a form as the signature declaration.